As stocks tumbled last month, investors took solace in a trade that’s performed admirably over the last three decades: buying Treasurys. 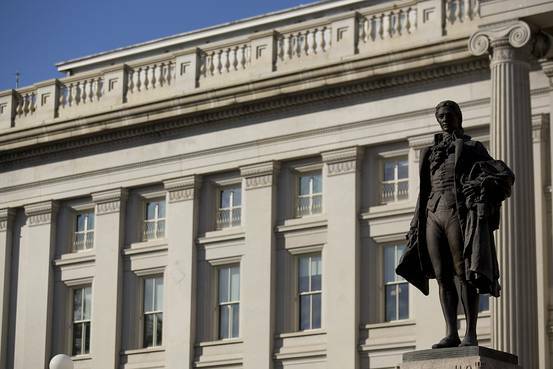 Investors put $2 billion into funds that hold Treasurys and other government debt during the five days ended Wednesday, marking the fourth straight week of strong flows to such funds, according to Bank of America Merrill Lynch data. It’s one sign that as concerns grow about a weakening U.S. economy, tumbling oil prices, and China’s decelerating growth, investors are increasingly betting that inflation won’t make a dramatic climb. That’s despite the Federal Reserve’s first interest-rate increase in nine years last month. Putting money in Treasurys turned out to be a good trade last month. A Barclays index of U.S. Treasurys returned 2.1% in January and an index of the securities maturing in at least 20 years returned 5.2%. As prices rose, the yield on the 10-year Treasury note closed below 2% for the first time since October. The yield stood at 1.96% on Monday, according to Tradeweb. The numbers illustrate an adherence to a strategy that continues to perform well, despite an abundance of naysayers. Even as many say long-term U.S. Treasury yields will rise markedly, ending the benchmark rate’s decades-long bull run, such rates continue to stay low. And if the negative sovereign yields in countries like Switzerland are any indicator, U.S. rates can go lower still. It’s easy to look at these flows as part of a “deflation” trade, said Michael Hartnett, chief investment strategist at Bank of America, in a recent research note. Investors are buying into funds that benefit when inflation stays low and selling funds that benefit when prices rise quickly. Another example of that trade: Since July of last year, money-market funds have been the most popular asset class, pulling in $208 billion. Both Treasurys and money-market funds look better when inflation is scarce, since quickly-rising consumer prices erode their value. Meanwhile, investors have been selling bets on inflation to rise, such as funds holding Treasury inflation-protected securities, or TIPS, which had their largest outflows in 33 weeks. This comes as no surprise to Lacy Hunt, whose firm, Hoisington Investment Management Co., has been holding long-term Treasurys for years. Their premise is that the U.S. economy, overburdened by debt, will struggle to grow at a robust pace and generate healthy inflation levels, all of which makes Treasurys look more attractive. “We believe that the secular low in rates is ahead of us, and not behind us, and the problems that the country is facing are going to take several years to work out,” Hunt said. If that’s the case, the deflation trade may look good for a while longer.